If you love me, you will keep my commandments. And I will ask the Father, and he will give you another Advocate to be with you always, the Spirit of truth, which the world cannot accept, because it neither sees nor knows it. But you know it, because it remains with you, and will be in you. I will not leave you orphans; I will come to you. In a little while the world will no longer see me, but you will see me, because I live and you will live. On that day you will realize that I am in my Father and you are in me and I in you. Whoever has my commandments and observes them is the one who loves me. And whoever loves me will be loved by my Father, and I will love him and reveal myself to him." Our readings today are anticipatory of Pentecost, which we will celebrate in two weeks. Traditionally, this coming Thursday would be Ascension Thursday, commemorating our Lord's return to the Father's right hand, where He now reigns and where He waits to return for the Last Judgment. After the Ascension, our Lady and the Eleven Apostles gathered in the Upper Room and were at prayer for nine days - the first novena - as they awaited the Descent of the Holy Spirit. The word novena comes from the Latin root word for "nine". Our diocesan celebration of Ascension Thursday was recently transferred to next Sunday - it takes the place of the 7th Sunday of Easter. In preparation for Pentecost, each of the readings this Sunday tell of the work of the Holy Spirit. In the first reading, we learn of the Holy Spirit accompanying the sacrament of baptism. 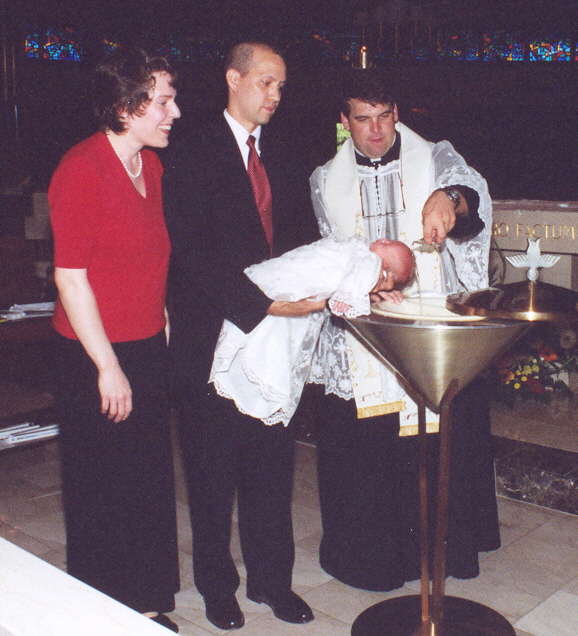 The infusion of grace into a soul at baptism means that the Spirit's Seven Gifts of wisdom, knowledge, understanding, counsel, fortitude, fear of the Lord and piety are poured into the soul of the baptized, as are the three theological gifts of faith, hope and love which enable us to believe, trust and love God in a supernatural way that assists us into everlasting life. Meanwhile, the second reading from the first letter of St. Peter presents us with another way the Holy Spirit assists us. St. Peter reminds us that the Holy Spirit helps us to endure suffering - to persevere in the face of great difficulty and temptations so that we can remain faithful to God in all things. In our Gospel, Christ promises to send the Holy Spirit as the great Advocate on our behalf. The Advocate or Paraclete was understood to be someone who would stand beside us to accompany, console, protect and defend us from the wiles of the enemy. Christ calls the Holy Spirit the Spirit of Truth. What exactly is the Spirit of Truth? We can know what the Spirit of Truth is by identifying its nemesis, the spirit of the flesh. Those who live by the spirit of flesh, which is a spirit of carnal indulgence, cannot recognize the Spirit of Truth because when the passions are constantly indulged, the mind and heart are clouded by a more intense pursuit of even greater carnal pleasure. This is true in the area of temperance when is come to food, drink and chastity and when it comes to using the gift of conjugal love. The person who lives in the flesh cannot hear God's voice because their passions and emotions are so overwhelmed by carnal pleasure. Even St. Paul admitted that the spirit and the flesh are constantly at war with each other. This is why we perform acts of mortification - so that the body does not control the soul and so that the body learns to succumb to the soul. The body is good, but it needs discipline in order to work in accord with the desires of the soul. Unfortunately, it can be the case that even the soul of one who lives according to the spirit of the flesh can become so numb to its own self-destructive behavior. The Spirit of Truth allows us to hear and listen to God's world, breathing and living within us. It is a spirit which leads to obedience. Pope Benedict XVI made reference to the Spirit of Truth in his installation homily in Rome last Sunday. He recognizes that listening to God's will is essential to his office as Pope. He said, "My real program of governance is not to do my own will, not to pursue my own ideas, but to listen, together with the whole Church, to the word and the will of the Lord, to be guided by Him, so that He himself will lead the Church at this hour of our history." I would like to close with a story told by Fr. Peter Girard, OP that demonstrates the action of the Spirit of Truth in the human person. Anthony Neyrot was ordained a priest by St. Antoninus of Florence in the 1400's. He was then sent to preach in Naples but his ship was hijacked by Islamic pirates who sold him into slavery in Tunisia. Anthony languished in a prison in Tunis, living on bread and water. Some time later, the Sultan discovered that Anthony was a man of learning who could be useful to the kingdom. So, he offered Anthony a deal. If Anthony would abandon his white Dominican habit and stop preaching Christ, he would get money, a position in court and a wife of his choosing. To everyone's surprise, Anthony took the deal and apostatized. He became a very devout Muslim and translated the Koran into Italian, while handling all of the Sultan's correspondence with the West. Time passed and the Sultan wanted to have a military parade. A large platform was constructed in the middle of the main square where the entire city gathered and Anthony was expected to be one of the dignitaries sitting on the platform. Shortly before the parade began, a message came to the court hoping to reach Anthony to let him know that Antonius had died and was now praying for Anthony from heaven. When the parade began, Anthony was nowhere to be found. He had gone home, put on his white Dominican habit and marched up the steps of the platform and in front of the sultan, began reciting the Apostles Creed. He never finished the Creed as he was stoned to death. His last words were, "And He became man." The one-apostate died a martyr. Blessed Anthony Neyrot was martyred because he preached the Spirit of Truth to a world that did not recognize it. May we be prepared to do the same in our own lives. We may not die a martyrdom of blood but we may experience a long martyrdom of persecution. Herein lies the paradox of our Faith: the more we embrace the Spirit of Truth, the more we will suffer because the world cannot recognize the Spirit of Truth. Thanks be to God that the story does not end with suffering. Rather, it ends with the triumph of the Cross that leads to the Resurrection, and the victory of life over death and good over evil!